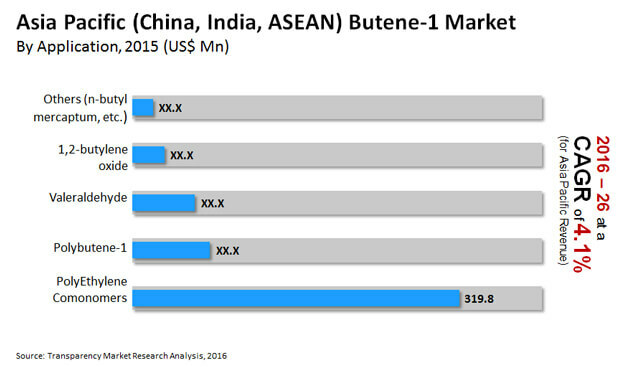 The Asia Pacific market for butene-1 is highly consolidated in terms of geography and is dominated by China. While India and ASEAN countries are key contributors to the market’s revenues, they have a scarcity of suppliers as well as large-scale manufacturers of butene-1, and the markets are thus undersupplied. The market in China, on the other hand, is oversupplied and helps satisfy the demand for butene-1 in the rest of the Asia Pacific. The market has moderate growth prospects and is expected to exhibit a 4.1% CAGR from 2016 through 2026, rising from a valuation of US$508.6 mn in 2015 to US$787.8 mn by 2026. On the basis of application, the butene-1 market in Asia Pacific is segmented into polyethylene co-monomer, polybutene-1, valeraldehyde, 1, 2-butylene oxide, and n-butyl mercaptan. Of these, the segment of polyethylene segment accounted for a share of nearly 65% of the butene-1 market in Asia Pacific in 2015, followed by polybutylene-1. Rising demand for HDPE (high density polyethylene) and LLDPE (linear low density polyethylene) products in the region is anticipated to keep the segment of polyethylene co-monomer the dominant revenue contributor of the Asia Pacific butene-1 market in the near future as well. A large number of plastic packaging materials are prepared from polybutylene-1. The flourishing growth in the region’s packaging industry in the past few years, which is a key consumer a variety of plastics, is expected to add to the demand for polybutylene in the next few years. The demand for polybutylene in Asia Pacific is also expected to be driven by the rising market for consumer goods and automotive interiors and exteriors. The segment held a nearly 15% share in the Asia Pacific butene-1 market and is expected to account for a similar share in the market by the end of the forecast period. On the basis of geography, the butene-1 market in Asia Pacific has been examined for countries such as China, India, and ASEAN countries. China held a 64.7% share in the market in Asia Pacific in 2015 and is expected to remain the dominant regional player throughout the forecast period as well. Since polyethylene is the chief application segment of the butene-1 market, growth of the polyethylene industry in China is anticipated to boost the demand for butene-1 as well, allowing China to remain the dominant market for butene-1. Growth in industries such as consumer goods and rising demand for automotive interior and exterior products in China, which has fueled the polybutylene-1 in the country, is also expected to boost the China butene-1 market over the forecast period. The butene-1 market in China is oversupplied owing to the availability of raw materials and presence of key players. The situation has helped satisfy the demand for butene-1 in rest of Asia Pacific. Production of Butene-1 in the ASEAN sub-region is primarily contributed by countries such as Malaysia, Singapore, Thailand, Vietnam, and Philippines. Growing end-user industries and availability of raw materials in ASEAN are anticipated to drive the demand for Butene-1 in the sub-region. The market is dominated by few companies and poses difficulties for the entry of new vendors. Notable players operating in the butene-1 market in Asia Pacific include Petrochemical Corporation of Singapore (Private) Limited, China Petrochemical Corporation, China National Petroleum Corporation, PetroChina Company Limited, and ONGC Petro additions Limited. Butene-1 is a nontoxic, noncorrosive and colorless gas or liquid with slightly olefin odor. It is an organic chemical compound and is one of the linear alpha olefins. It is easily condensable and highly flammable. Butene-1 is generally produced by a variety of methods such as refinery operations, steam cracking of C4 hydrocarbons, butane dehydrogenation, alfa olefin manufacturing (produced as a co-product), catalytic ethylene dimerization, butyl alcohol dehydration, and pyrolysis of butyl acetate and butyl chloride. Butene-1 is generally used as an intermediate in several applications such as polyethylene, polybutene-1, valeraldehyde, and 1, 2-butylene oxide. The report provides in-depth analysis and forecast of the Butene-1 market in Asia Pacific. It comprises forecast for the period from 2016 to 2026, in terms of volume (kilo tons) and revenue (US$ Mn). Quantitative data has been derived through extensive secondary research of the Butene-1 market in Asia Pacific. Secondary sources typically include company websites, relevant magazines, government documents, and press releases. Top-down approach has been adopted to derive the revenue and volume figures for the Butene-1 market in Asia Pacific. Furthermore, bottom-up approach has been employed to derive data for various application segments based on demand for Butene-1. A combination of top-down and bottom-up approaches helps validate the quantitative data. The data was further validated with the help of primary research, with industry experts, to ensure accuracy of derived numbers. Detailed analysis of various factors driving the Butene-1 market in Asia Pacific has been included for astute decision-making. Impact of these drivers has been analyzed with the data to substantiate research findings. Furthermore, factors restraining the market growth have been included for better understanding of the market. Impact of these restraints has been analyzed over the course of the forecast period. The report also comprises various opportunities available for market growth during the next ten years. Opportunities entail untapped or recently explored factors that are anticipated to drive the Butene-1 market in Asia Pacific during the forecast period. The report includes value chain analysis to help understand the market thoroughly. Various processes employed in the manufacture of Butene-1 have been included in the report. Porter’s Five Forces Model has been utilized to determine the degree of competition in the Butene-1 market in Asia Pacific during the forecast period. Key player capacities and operating capacities market has been included for better understanding of the competitive landscape. Furthermore, market attractiveness analysis has been conducted to analyze product segments that are expected to be lucrative during the forecast period. This is based on various factors such as market size, growth rate, profitability, raw material procurement, and competition in the respective product segment. Based on application, the Butene-1 market in Asia Pacific has been segmented into polyethylene, polybutene-1, valeraldehyde, and 1, 2-butylene oxide. The report comprises detailed analysis of all segments of the Butene-1 market in Asia Pacific and forecast based on current and future trends in the market, in terms of volume (kilo tons) and revenue (US$ Mn). Demand for Butene-1 in every application segment has been analyzed and forecast for the period of ten years.